HEB is one of my preferred supermarkets. A Texas-based chain, they have great prices, and usually excellent selection and quality - even the house branded items are terrific (I go out of my way to get HEB lactose-free milk). But this is one thing that keeps bugging me - the packaging of HEB butter. 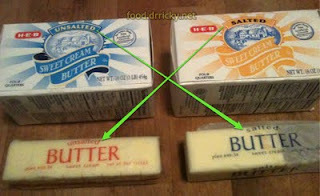 The unsalted butter is packaged in blue themed boxes, but the labeling on the individual bars are in red. This wouldn't be a problem, if it weren't for the fact that the salted butter uses blue labeling for the individual bars! I have made the mistake of grabbing the wrong type one time too many.